The Book Rat: 30 Day Book Binge PRINTABLES! Did you forget that the 8th 30 Day Book Binge is going on? BECAUSE I TOTALLY DIDN'T. . . Okay, seriously, I have been reading every day, but that's mostly because I have a daily reading streak going of almost a year and a half, and I'm not about to break it. But I did forget to upload some printables for ya, and I'm gonna fix that right now. As I mentioned in the 30DBB invitation video, this month's theme is lavender; I used this theme last month in my bullet journal, and I loved it so much, I'm not ready to let it go. So, in our Book Binge folder, you'll find a new lavender-themed 2019 calendar and a set of three bookmarks (one of which will help you keep track of your daily reading! ), also in a minimal, sketchy lavender theme. I've included the files in two forms, pdf and png, so that you can either download and print, or use digitally, as you choose. And make sure to check back for more, because I have some other printables up my sleeve! Feel free to join in on this simple, low-pressure challenge by grabbing a book and reading every day for 30 days -- and by sharing your progress on anywhere hashtagable, with the hashtag #30DayBookBinge! If you have requests of printables you'd like to see in future 30 Day Book Binges, please let me know in the comments! LOL, I've forgotten stuff- so many times. But, I've been reading each day. 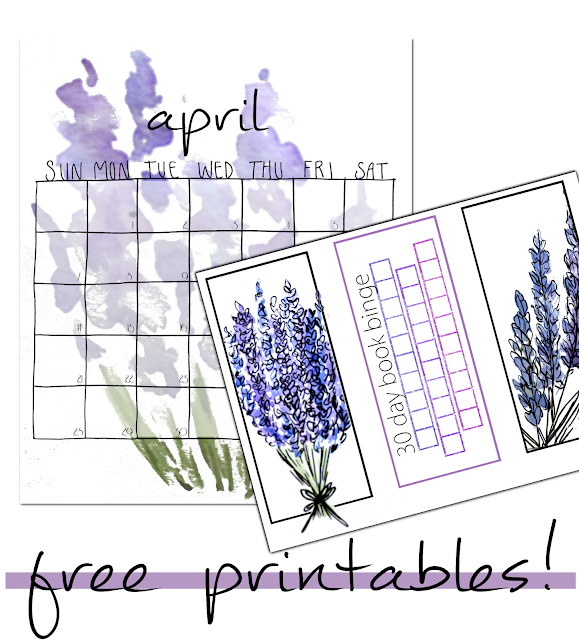 Lovely printables, Misty!